Today we are sharing With You very Important Railway Previous Year Questions Papers and shared Delhi Metro Rail Corporation (DMRC) Model Question Papers for your better preparation. 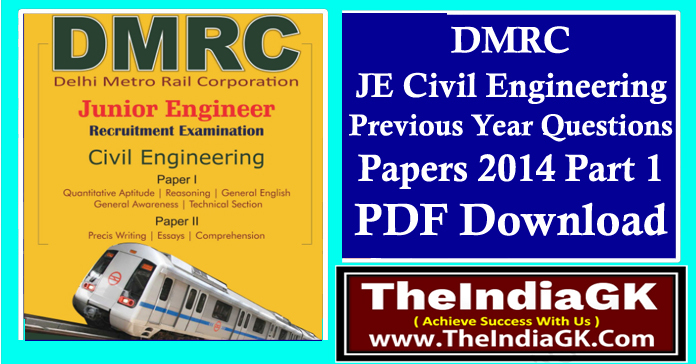 You can download this PDF Form and prepare for your upcoming competitive examination. For the latest general knowledge and newest Current Affairs, subscribe free and join us. For the continuation of other updates in current Current Affairs, India GK and New Miscellaneous Important GK in English / English, please visit us at the India GK FACEBOOK and Google Plus, on Like Like, Follow on Twitter ... Our blog will be very useful for preparing for government exams or competitive exams. In here every day is the information sharing that you have to work for all! If you want to read such a post, then we must follow!